After yesterday, I needed to cool off, so I experimented with my new frozen popsicle mold. Because Bob always takes pears for lunch at work, we almost always have Costco pears. 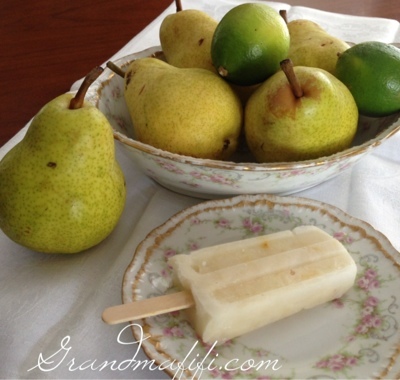 Many paletas recipes call for limes, and we had Costco limes next to pears in the fridge. I used a standard 10 pop mold from Amazon. I'm glad I read the comments before buying, or I never would have understood the need to put the sticks in about 45 minutes after beginning the freezing or that, to remove the pops, one should run the mold under warm water. I like to think I would have figured this out but apparently some people were mystified. Simmer 5 minutes, then let cool. I mushed the pears up with a fork at this point. Pour into molds (leave a little space for expansion) and place in freezer. After 45 minutes insert sticks. After 6 hours, unmold using warm water and put each pop in a sandwich bag, seal, and freeze. Very simple and good. Bob asked for seconds and decided they were "darn good", significantly better than the frozen fruit bars, which he loves, so this is a win.